On a warm Spring morning in 1996, I sat atop a rocky outcropping overlooking the barren expanse of Walker Basin, trapped as it is in the fatty folds of the Piute Mountains at the extreme southern tip of the Sequoia National Forest. I have a small, one-room cabin located there, situated on a handful of acres carved out of what was once a prosperous mining district. On that particular day, I was bored and unemployed; much in need of a creative outlet for expression pending the return of life and a steady paycheck. Finding none, I decided to write a monthly column instead. Which just proves that if you think you can do something, that doesn't mean you can. I hope my experience doesn't offer even a glimmer of hope to anyone. I wrote and mailed my first three columns to The Fence Post Country Reader, a monthly compilation of news, local history and features published in Caliente, California, the mailing address for pretty much everyone who lives in Walker Basin. The editors and publishers, Rick and Donna Zanutto, were apparently preoccupied that day and my columns somehow slipped by them and into print. That tradition continues even today. 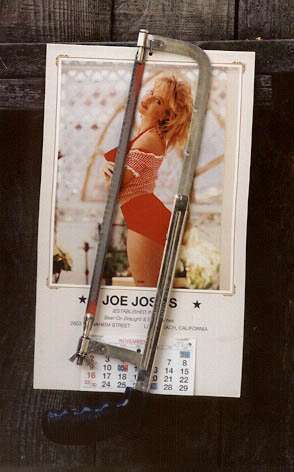 It may have occurred to you--the reader--that Calendar Hacksaw is a pseudonym. If that somehow escaped you, that's fine, too. Being anonymous has proved beneficial, as it makes it possible for me to eavesdrop on the local populace while they wine and dine at the Twin Oaks General Store or Karen's Bar & Grill, then twist their conversations into something they would never recognize. I think that is my strongest suit. Though I live in the Piutes part-time, my mind is there full-time. The people of the community have been wonderful to me, and if anything, my column represents an attempt to get even with them for debts that can never be fully repaid. I generally prefer not to receive valid criticisms or complaints about my columns, unless they come from my fellow columnist Wayne Moody ("Half Truths and Tall Tales"). So if you have anything on your mind, mail it to Moody. All other communications are welcome. I intend to update these introductory remarks on a fairly regular basis, so if you don't like them, don't worry; they'll be replaced soon. Perhaps you would like to write them for me. In the meantime, I look forward to delivering the commencement address to the students at Piute Mountain School next June. I also look forward to winning a Pulitzer Prize. Neither is likely to happen, though the speech is already written and will probably just serve as a column instead. So feel free to roam around my webpage and see if anything interests you. Just click on the "Thunderhead" link at the top or bottom of this page, and you'll be magically transported to The Calendar Hacksaw Morgue, updated monthly. P.S. This website was not my idea. It was a birthday present, and I am most appreciative of the efforts put forth by my friends to make it happen. Don't you wish you had friends?